A "humanitarian pause" in attacks on rebel-held eastern Aleppo - part of a plan to allow civilians and fighters to leave - has come into effect. The unilateral truce, announced by Russia, will last until at least 19:00 (16:00 GMT). Eight exit corridors have been designated from the east. Russian and Syrian air strikes have been halted since Tuesday. Rebels have rejected the plan and there are reports of clashes at one of the corridors out of the east. Only a few civilians have been evacuated so far, if any, and various parties to the conflict are blaming each other for this. Russia and the West: Are we entering a new cold war? A correspondent in Aleppo for Orient News, a Dubai-based pro-opposition TV channel, said he and his crew had visited the two crossings intended for evacuation, but only a few civilians had left at the very start of the ceasefire, and none since then. 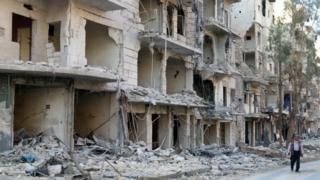 Ammar Jaber accused Syrian government forces of targeting the corridors with sniper and rocket fire. He said "fierce clashes" were continuing and 15 people had come under sniper fire. Syria's state-run news agency has blamed "terrorist groups" for the attacks, and the Russian state-run broadcaster Rossiya 24 said members of Jabhat Fatah al-Sham, a militant group once aligned with al-Qaeda, were preventing people from leaving. And a teacher in Aleppo, Wissam Zarqa, told the BBC: "To my knowledge, none could leave." He said he thought "no arrangements had been made" for medical evacuations. Last month, Syrian government forces encircled the eastern section and launched an all-out assault backed by Russia. Some 2,700 people have been killed or injured in the bombardment since then, according to the Syrian Observatory for Human Rights, a UK-based monitoring group. About 250,000 civilians who live in Aleppo have been trapped by the fighting. Western leaders have said Russian and Syrian air strikes on Aleppo could amount to war crimes, an accusation rejected by Russia. In other developments, the Turkish military says its jets have attacked the Kurdish YPG militia north of Aleppo, killing up to 200 fighters. But a senior Kurdish commander, Mahmoud Barkhadan, told the Associated Press news agency that no more than 10 of his fighters had died. The UK-based monitoring group the Syrian Observatory for Human Rights said on Thursday that at least 11 people had been killed, with 24 reported injuries. The group compiles information from a network of contacts on the ground. The YPG is supported by the US in its fight against so-called Islamic State, but Turkey regards it as a terrorist organisation. Russian Defence Minister Sergei Shoigu said earlier this week the pause in the bombing would help "guarantee" the safety of six corridors through which civilians could leave. Rebel fighters have been offered a chance to leave with their weapons via two corridors. Jihadist group Jabhat Fateh al-Sham, which was known as al-Nusra Front until it broke formal ties with al-Qaeda in July, has vowed to fight on. "We choose not to give up our people," it said. Mainstream rebel factions also dismissed Russia's proposal as a gimmick. The UN, which regards Jabhat Fateh al-Sham as a terrorist organisation, says the group has 900 fighters inside Aleppo, out of a maximum of 8,000 rebels in total.